This survey focuses on the Labor-Management Partnership (LMP) and Unit-Based Teams (UBTs). It is jointly sponsored by the Alliance of Health Care Unions and Kaiser Permanente. Your union and management leaders urge you to take the time to complete this survey so that we can understand your perspective and concerns. Your individual answers are fully confidential and anonymous. 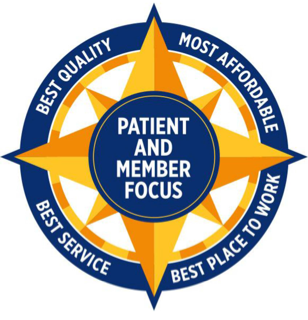 Union and management leaders will use your responses to improve patient care, quality, your work experience, and the Labor-Management Partnership, consistent with the LMP value compass. We have engaged Professor Joel Cutcher-Gershenfeld at Brandeis University to manage this survey with his colleagues in a research organization called WayMark Analytics. This will enable a rigorous survey and the ability to share results with you, as well as other unions and employers. At the beginning, you will be asked to review language that is required by Brandeis University to ensure that you understand your participation is voluntary and does not pose significant risks to you. You may complete this survey with a work computer, so long as it does not impede patient care. If you need to stop at any time, click on the “save” button in the upper left corner of the survey screens (after this intro and consent). You will then be emailed a link so that you can continue from where you left off. If you have any questions, contact information for Professor Cutcher-Gershenfeld and WayMark Analytics can be found below. If you are a union member, you are also welcome to contact your own local union or the Alliance of Health Care Unions by phone at 510-541-7528 or by e-mail at: cassandra.braun@ahcunions.org. Anyone in Kaiser-Permanente can also contact the Labor-Management Partnership office by by phone at: 510-271-6444 or by e-mail at: ian.e.king@kp.org with any questions that you have about the survey. Your participation is voluntary: We welcome your taking this survey, which is voluntary. You may refuse to take part and you may choose to stop at any time. Your responses will be confidential: The responses to this survey will be kept completely confidential. No individual responses will be identified. Although your name, e-mail address and NUID are requested below to indicate your voluntary consent, this information will be stored separately from your survey responses in order to maintain confidentiality. Estimated time to complete: It is estimated that this survey will take approximately 15 minutes to complete. Benefits of the research: The benefits of taking the survey are that the data can contribute to continuous improvement in member/patient care, more effective UBTs, a stronger Labor-Management Partnership and improvements in the quality of working life. Feedback on the results will be provided to all who participate in the survey. Risks of participating: This survey-based research poses minimal or no risk to participants – no greater risk than is associated with everyday work and leisure activities. Additional uses of the data: It is possible that the data will be used in scholarly research. Any additional research involving the data will also maintain confidentiality and be conducted in consultation with the Labor-Management Partnership. Questions: If you have questions, concerns, or complaints at any time about this research study, please feel free to contact the Principal Investigator who is leading the research for the Labor-Management Partnership: Joel Cutcher-Gershenfeld, PhD, at Brandeis 781.736.3998 or joelcg@brandeis.edu. Because Joel Cutcher-Gershenfeld is on the faculty at Brandeis University, this research is subject to the Brandies Human Research Protection Program and you may also contact them by phone at (781) 736-8133 or via email at irb@brandeis.edu. a) Your participation is completely voluntary. b) You have the right to withdraw from taking the survey at any time. c) Individual responses will be kept confidential, including the outside survey provider storing the signature information below separately from the rest of your survey responses to ensure anonymity. d) It is expected that this research poses minimal or no risk to participants. 2. Email Address (personal or work) *This question is required. This question requires a valid email address. 4. I have read this statement, I am 18 years old or older, and I agree to participate in this research *This question is required.